You know how much I love Molton Brown and if you've been reading my blog or any amount of time, you will also know that I love a good deal so today's post is a combination of the two! 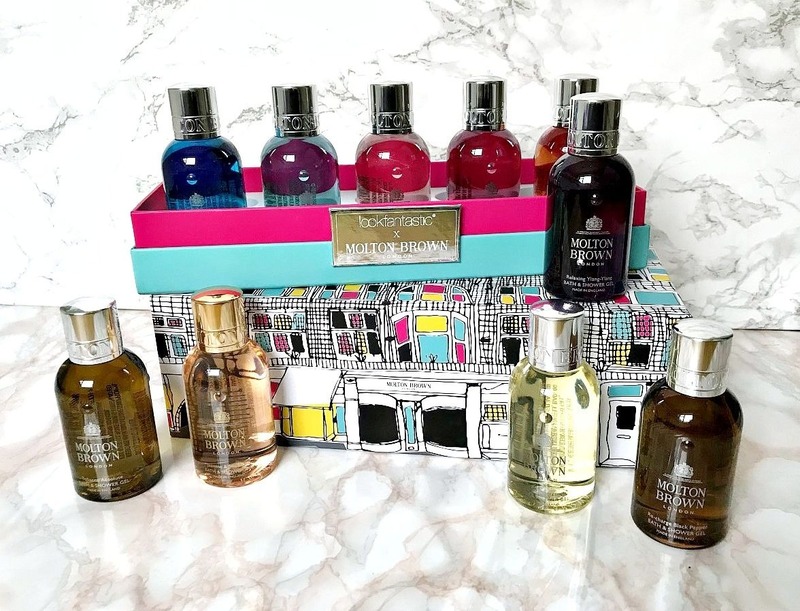 The Lookfantastic X Molton Brown Limited Edition Beauty Box is a real bargain and is bound t to sell out quickly so don't hang around too long if you want to get your hands on one! The beautifully decorated box contains 10 different 100ml Bath & Shower Gels with a value of £70 for only £35 or if you are a Look Fantastic Beauty Box subscriber, you can save an additional £5 by using the code MOLTONBROWNBB at the checkout. Molton Brown Bath & Shower Gels fill the bathroom with fragrance and the scent lingers on the skin. Also, the fragrance combinations are really beautiful so this would make a fantastic gift! Blissful Templetree Bath & Shower Gel - notes of orange, jasmine, lilac, vanilla and patchouli combine to create this beautiful scent. Coastal Cypress & Sea Fennel Bath & Shower Gel - refreshing combination of fig leaves, bergamot, musk and salted cypress. Delicious Rhubarb & Rose Bath & Shower Gel - in addition to rhubarb and rose, notes of lemongrass, vanilla and musk combine to create a warm, soothing scent. Fiery Pink Pepper Bath & Shower Gel - this warm, spicy scent combines notes of pink pepper, ginger, nutmeg, cedarwood and patchouli. Heavenly Gingerlily Bath & Shower Gel - an exotic combination of cardamom, ginger, sandalwood, tuberose and musk. Jasmine and Sun Rose Bath & Shower Gel - a warm fruity-floral fragrance with notes of peach, bergamot, jasmine, patchouli and musk. Orange & Bergamot Bath & Shower Gel - a revitalizing scent combination of orange, neroli, musk, bergamot and cedarwood. Re-Charge Black Pepper Bath & Shower Gel - a zingy, spicy scent with notes of lemon, ginger, black pepper, vetiver, coriander and basil. Relaxing Ylang-Ylang Bath & Shower Gel - tangerine, jasmine, ylang-ylang, vanilla and musk combine to create this beautiful soothing scent. Tobacco Absolute Bath & Shower Gel - a woody scent with notes of bergamot, elemi, nutmeg, tobacco and cedarwood. This would make an ideal Christmas gift for someone who travels regularly as they are the perfect size for hand luggage. It would also be a fab gift for someone who likes some Molton Brown scents but hasn't tried all of the fragrances as this will give them the opportunity. Also, 100ml means that they can be used for a few weeks to get a real idea of which one is your favourite. It's incredible value at £35, but is bound to sell out so if you want to get your hands on one, you need to act fast! Buy here. Have you started your Christmas shopping yet? Are you a fan of Molton Brown? I'd love to hear! All products are bought by me, unless otherwise stated. This box was kindly sent to me. Opinion is always my own. Affiliate links may be used.